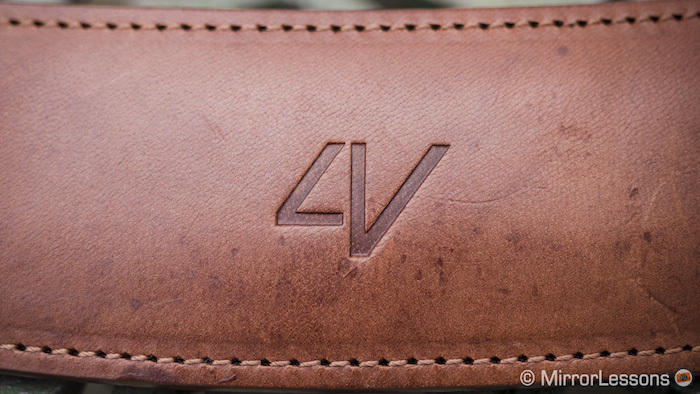 At the Photography Show in Birmingham, we recently had the pleasure of meeting the 4V Design team and their distributors, MAC Group Europe. 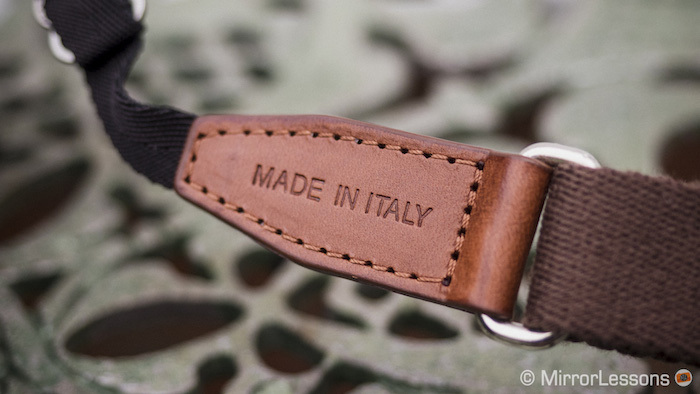 Based in the city Treviso only a short distance from Venice, this Italian company produces hand-made quality leather straps for mirrorless cameras and DSLRs. They pride themselves on using the best Tuscany vegetable tanned leather, called “cuoio” in Italian, and preserving traditional techniques of cutting, stitching and painting in the production of their products. We were invited to test and review one of the company’s popular neck straps, the Lusso Large. 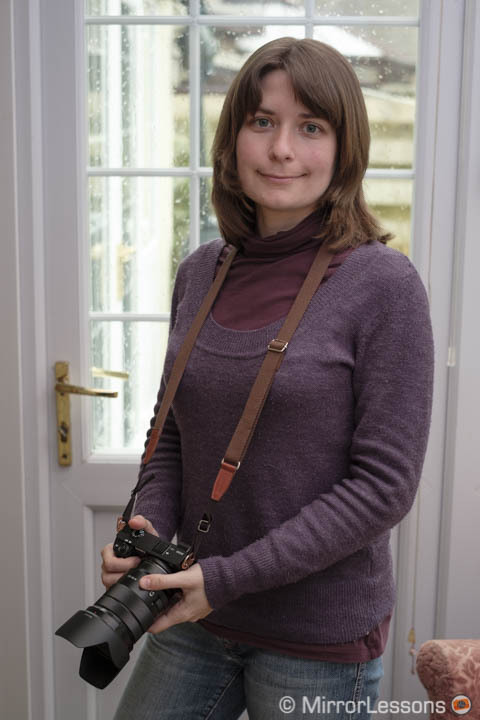 It is a good match for mirrorless interchangeable lens cameras of all sizes, as well as small to medium sized DSLRs. 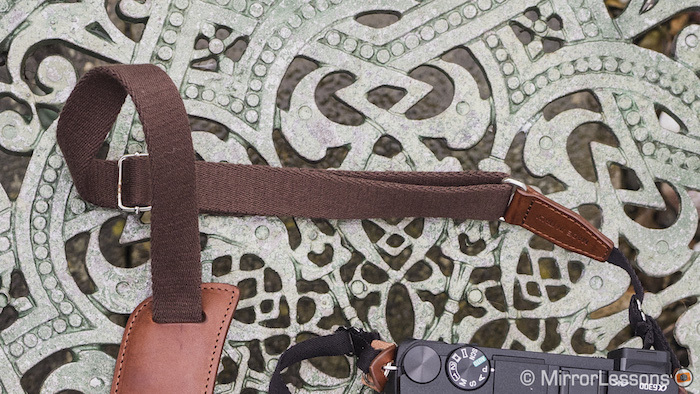 “Lusso” means “luxury” in Italian, and this strap certainly lives up to its resplendent name in terms of both appearance and usability. 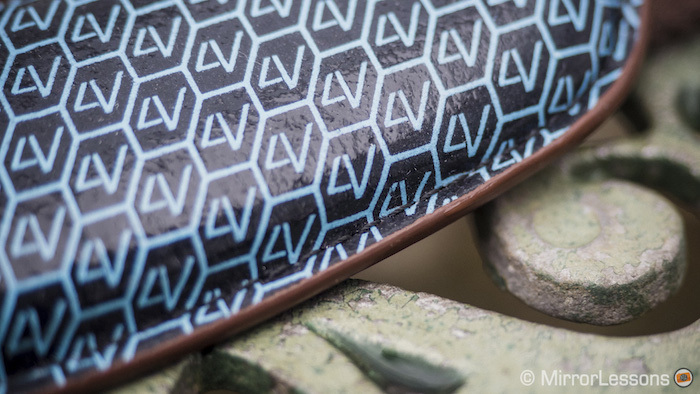 What first jumps out at you is the substantial shoulder pad embossed with the 4V Design logo. The top is covered in smooth and flexible anti-allergenic leather that has been expertly stitched and hand-painted along the edges. 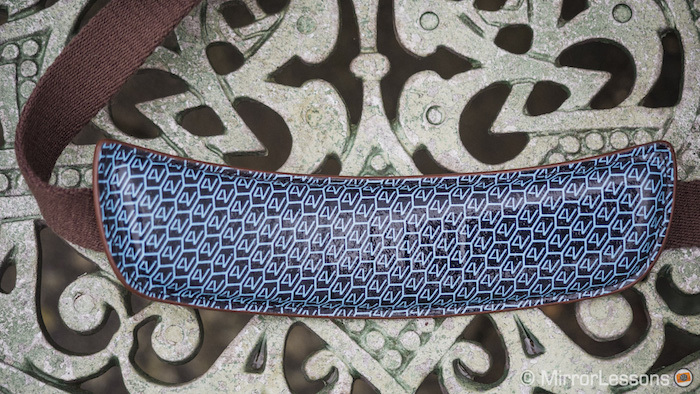 At 4V Design we are so confident in our quality that we proudly signs some of our straps with the contrast stitching in cyan, our bright corporate color. This despite the fact a contrast stitching is extremely difficult to manage in production: it can easily highlight inaccuracies and defects. For ultimate discretion, there is also a purely black version with black stitching. Turning to the back of the shoulder pad, we find the memory foam “Ultra-Grip” padding that has been gently curved to fit the contour of your neck or shoulder. Taken from motor-sport race suits, it features a jazzy design that once again recalls the corporate colours and logo. This weatherproof and washable material stops the strap from sliding off your shoulder or shifting back and forth while around your neck. 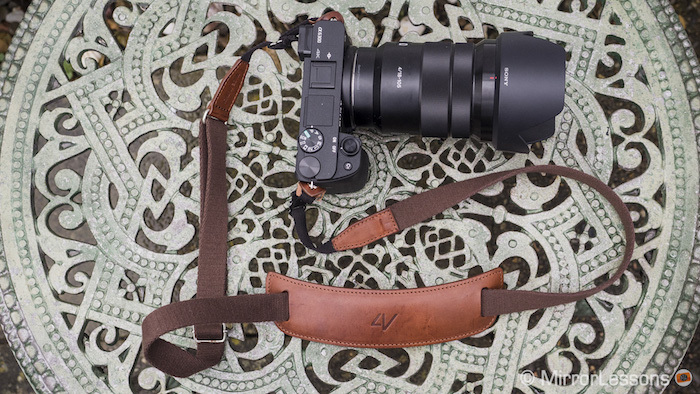 Having used it with the Sony a6300 with the 18-105mm f/4 for over two weeks, I can confirm that it is comfortable to wear around the neck and on your shoulder for long periods of time, and given the quality of the leather and padding, it should only get more comfortable with time and use. The one issue I’ve come across with the padding will only affect those with hair that is shoulder-length or longer. Since it is so grippy, your hair can easily get caught underneath the padding, causing some discomfort if you suddenly try to move the strap or free your hair. 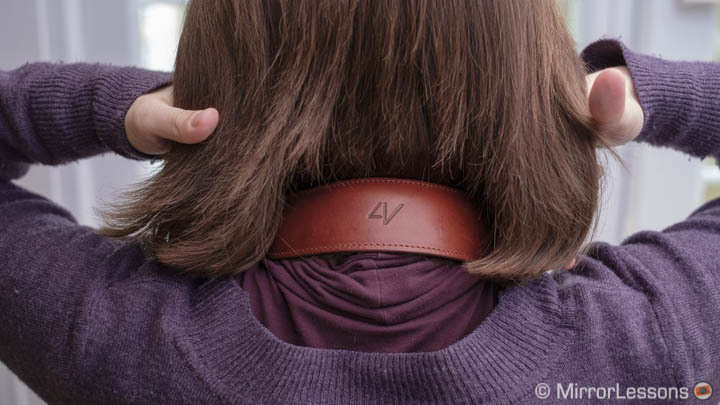 The Lusso strap’s grippy padding traps long hair. 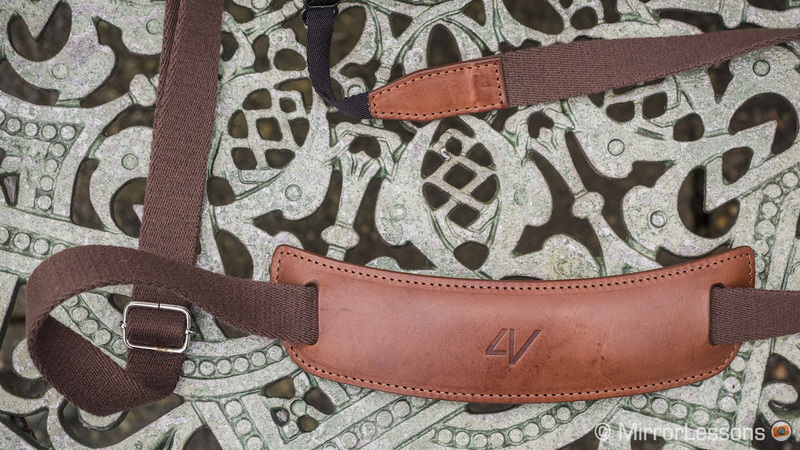 Unlike other straps in the 4V Design collection that are leather throughout, the Lusso Large comes with a robust cotton canvas strap whose length is adjustable via a metal buckle. It goes from 105cm to 134cm, which is enough for most heights. I feel it was a good choice to use cotton, as it takes more time for pure leather straps to gain softness and flexibility. 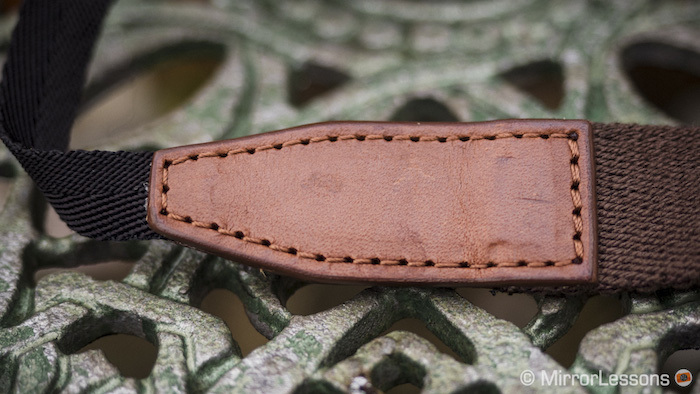 Reinforcing the canvas strap are three stitched leather accents: one near the buckle and two linking to the attachment band. The attachment bands are made of 100% polyamide and are derived from military application bands, making them strong, durable and quite easy to adjust. The strap comes with a classic metal split ring attachment with anti-scratch protective leather pads. Once you’ve gone through the fiddly process of attaching the metal rings, the bands are very easy to attach and remove and the pads do a good job of separating the rings from the camera. 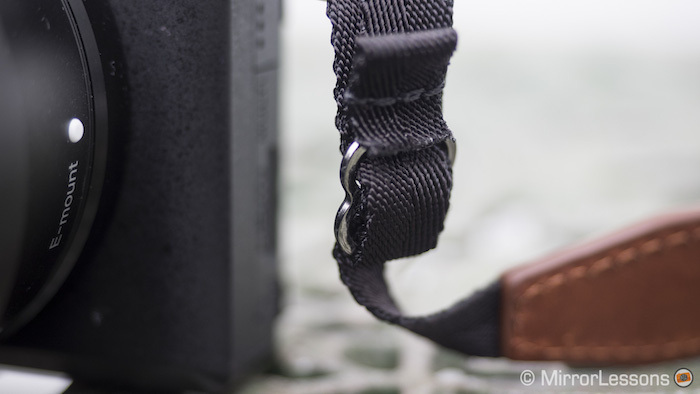 Looking at the 4V Design website, it appears that the Medium and Slim straps in the collection come with an additional 10mm band quick release. The fact that it doesn’t come with the Lusso Large suggests that probably isn’t robust enough for larger cameras. 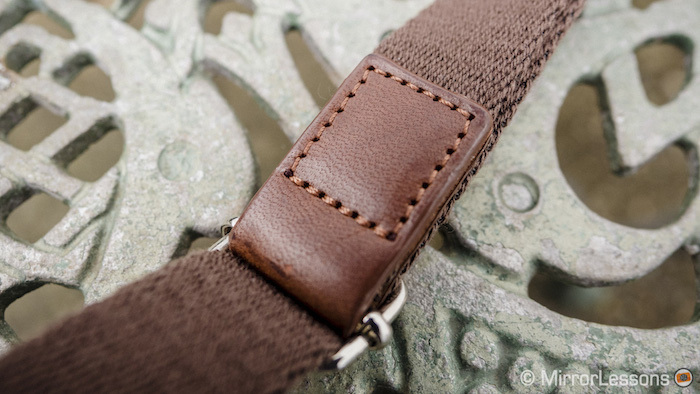 I test many camera straps every year from large manufacturers and artisans alike, and it can often be a challenge to come up with something unique to say about each product. In the case of the Lusso Large strap, the main point of debate is the Ultra-Grip padding which I consider both its best and worst characteristic. 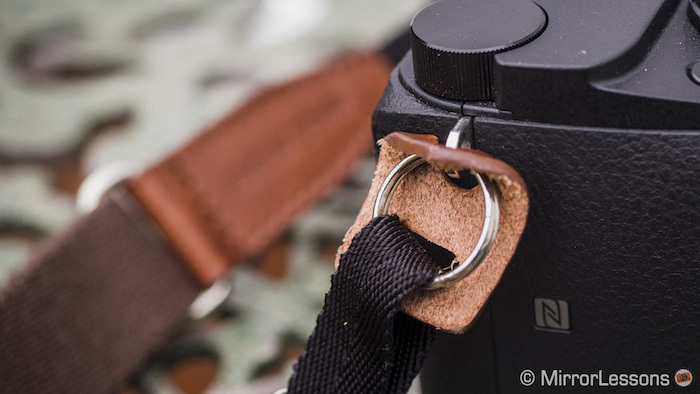 On one hand, it is very comfortable thanks to the memory foam and does an excellent job of stopping your strap from slipping, which is especially advantageous if you frequently carry your camera on your shoulder. On the other, the padding can easily trap and pull on your hair if it is shoulder-length or longer due to its grippy nature. This won’t pose a problem for most men, but women and men with long hair may experience some discomfort if they forget to move their hair out of the way before placing the strap around their neck or on their shoulder. The build quality is exceptional, which is most evident in the extreme attention to detail in the stitching and painting of the leather. Though I’ve only had the strap for a couple of weeks, I am sure it will last for years to come. In addition to the Lusso range, there are also the following models in the 4V Design collection: Classic / Sella / Ala (neck straps) and Ergo / Watch (wrist straps). You can see the full catalog here. Available for purchase at the SpeedGraphic and Clifton Cameras in the UK.